On any given day, you may be juggling teaching, writing a proposal, planning a lab or field experiment, managing your research group, attending to departmental politics, and, if you are very lucky, playing with some hard-won data. Amidst all of this activity, what data management actions should you be taking? 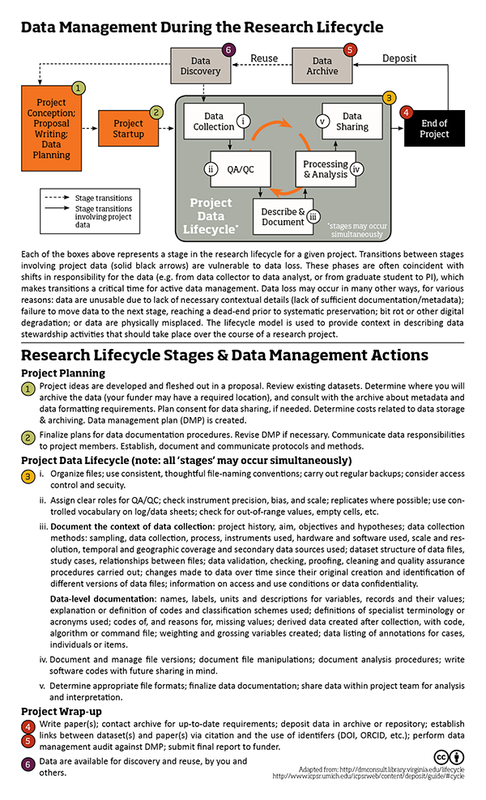 A schematic of the research lifecycle linked with data management activities can a a helpful tool. While it is impossible to cover every detail on one page, the figure below will provide you with guidance wherever you are in the cycle. If you have any questions, don't hesitate to contact Research Data Services for assistance or clarfication.